NEO Endurance is pleased to announce the provisional schedule for season 2 (2015-2016). With season 2 NEO continues to build on the foundation established in season 1. The number of races has been increased and a new race length has been introduced. Season 2 will start on October 18th at Sebring International Raceway. For the first three rounds of the teams will stay in the US for the North American tour. After Sebring the NEO teams go to Circuit of the Americas. The final race of 2015 will be held at a new track for NEO, Watkins Glen International. Both COTA and Watkins Glen will be 6 hours. In 2016 the season continues with the 8 hours of Spa-Francorchamps. After Spa the cars go to Brazil at Interlagos for a 6 hour race. The final two races are held in Europe. 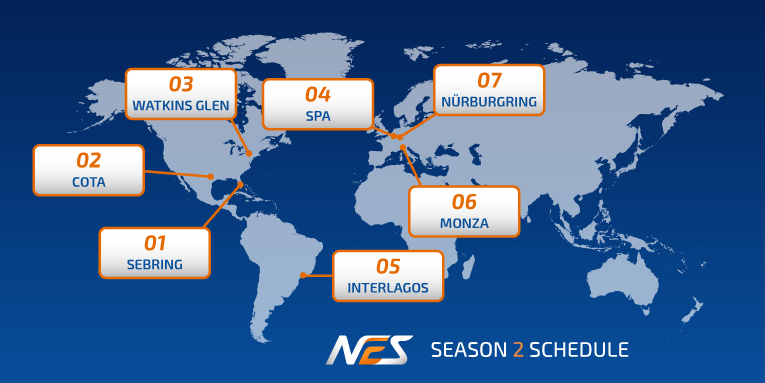 The 6 hours of Monza and the 8 hours of Nürburgring are both new to the NES schedule. There also might be an official pre-season test day. This is still being discussed at the moment. Gathering of Tweakers is also back and will host a second season of GES, the support series for the NES. The GES follows the NES schedule and will race on Saturdays. The top 3 at the end of the championship will earn an automatic invite for NES. For more information about the GES go to got-racing.eu. Racespot and NEO will continue their partnership in season 2. All 7 races will be broadcasted live, from start to finish, by Racespot. Niel Hekkens said: “Racespot is the obvious choice for us. We have a good relationship and they are simply the best sim racing broadcast team.” The events of GES will also be broadcasted. For more information about Racespot, go to racespot.tv. ** Subject to change, depending on the 2016 WEC schedule.